After much anticipation, I finally paid a visit to La Rioja, the semi-new Spanish tapas place on Broadway and 33rd street. Kimberly, my tapas-partner-in-crime came with, and since we went on a weekday, we took advantage of their $12.95 lunch special. It was so worth it, and we brought home tons of leftovers for the next day. There's no doubt about it, La Rioja is very simple. While it's modern and spacious, there's not much to the ambiance aside from a nice wooden bar and a fun little back section that serves as a specialty foods store. On a weekday, it was empty but I'd like to see it on a Friday or Saturday to gauge how lively it could get. The music was low-key, and the overall vibe was one of peace and relaxation, as we were able to sit comfortably without being rushed. I almost felt like I was in Spain on a late afternoon siesta, it was nice. Rioja's lunch offering was impressive and the choices were plentiful, including a choice of soup or salad, an entree, dessert, coffee/tea and soda. As we usually do, Kimberly and I ordered different dishes and shared them--it's the best way to get the most bank for your buck. 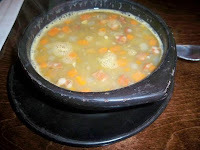 Soups - They had two soups available that day - a lentil/chorizo soup and a classic Caldo Gallego, which included vegetables such as escarole and white beans as well as chorizo and another Spanish ham. Both soups were excellent, and were a great way to start our lunch. Although I preferred Kimberly's lentil because it was smokier, mine was delicious as well and a bit lighter on the stomach. The portions were so large that I took half of my soup home and ate it the next day--I thought it was even better as a leftover. Entrees - We ordered two typical Spanish dishes for our mains, which included the Arroz con Pollo y Chorizos and the Gambas al Ajillo (shrimp in garlic sauce). 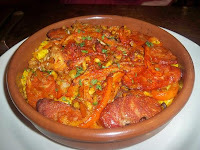 Again, we devoured both but my favorite was the arroz con pollo, once again because of the excellent chorizo. The yellow Spanish rice that comprised most of the dish was so deeply flavored by the chicken and chorizo, that I could've eaten it on its own. My only complaint was that the chicken was a tad dry, but in terms of flavoring, it was spot on. The gambas (shrimp) were excellent too, although not the best I've had. The garlic sauce was pungent and homey, a great winter dish. Even though the shrimp came with its own side of Spanish rice, it was fun to mix it into the arroz con pollo rice because it gave the former dish another delicious element. Just like the soup, both entrees tasted awesome the next day. 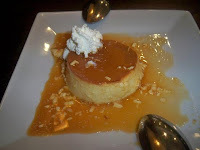 Dessert - A traditional flan was offered for dessert and judging by how wonderful everything else had been, we were excited. However, we were disappointed by the end result, as what turned up on our plate was a sad-looking shredded piece of custard instead of the silky, creamy delicacy that it's supposed to be. Taste-wise it wasn't bad, but the texture was all wrong. I'm hoping it was a fluke, but I'd be interested to hear if anyone else had the same experience. I loved the service here - it was personal and everyone was hospitable. We felt relaxed and even practiced our Spanish with our waiter a bit. He seemed personally invested in our having a good experience and asked if all was OK when we had dishes wrapped up. We politely explained that they were just too large to finish--he understood but the mere gesture that he cared to ask was nice. Definitely agree with this review...food was very authentic but the overall experience left a little something to desire--maybe just lacked a little bit of healthy hustle-bustle. Also would have been nice if the Spanish sodas were included in the prix fixe (or at least an option to upgrade for a buck or something like that). Your impression of La Rioja seems to be better than mine. I went there with a friend back in september and I remeber the food being bland. We had their paella and it was dry and had no flavor. No complaints about the service. Maybe I need to try it for lunch instead.... I do miss the Portuguese restaurant that was there before. Now, their food was rockin! Anon - definitely try it for lunch, it's good. I heard good things about Arcos (the Portuguese) place too. I love La Rioja. The service is excellent and the food is fantastic. For me, this restaurant tastes just like Spain! Try the anchovies with avocado and the bread pudding. Anchovy with avocado? Sounds really interesting - how is it served?